Quasars are very bright objects that are generally billions of light years away. We now know that they are a kind of active galactic nuclei (AGN) and are powered by supermassive black holes in the centers of galaxies. We know this in part because they emanate from within galaxies, and their energy comes from a region only a few light years across. But how do we know the size of something from billions of light years away? At that distance, a quasar is too small for us to measure its size directly, but we can do it indirectly by measuring the variation in a quasar’s brightness. 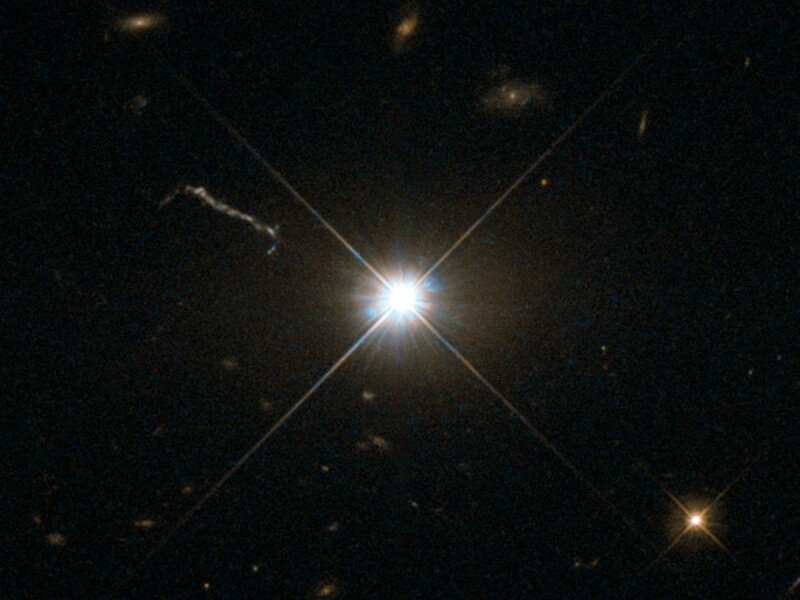 Take, for example, the brightest quasar in our sky (in the visible spectrum) known as 3C 273. It’s redshift puts it at about 2.5 billion light years away. Because of its brightness and relative closeness, it is one of the most studied quasars. So we actually have quite a bit of data on it. One of the things we’ve observed is that its brightness oscillates over time, getting slightly brighter and dimmer about 15 times a year. We see this variability in other quasars, but 3C 273 is the most accurately measured. Quasars plotted as a function of their size. A varying brightness is interesting because it tells us something about the size of the source. Basically if an object is changing brightness, it can’t do that at a rate faster than the time it takes one side of the object to know what the other side is doing. That time is limited by the speed of light, so if you know the rate at which brightness varies, you know the maximum possible size of the object. Since these objects are also greatly redshifted we have to account for that as well (high redshift means time dilation), but that’s pretty easy to do. 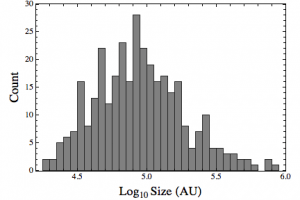 So we can take our quasar and AGN observations and calculate a maximum size for each one. Taking data for various quasars, I’ve plotted how many are at each particular size. While they vary in size, the most common size is most commonly around 5 on this graph, which equates to 100,000 AU, or about 1.5 light years across. That might seem pretty big, but remember that these objects are brighter than our galaxy (consisting of 200 billion stars). On a galactic scale these objects are tiny. Given their large brightness and tiny size, we can say pretty confidently that they are powered by black holes. There’s other evidence to support this conclusion, but that’s a story for another time.